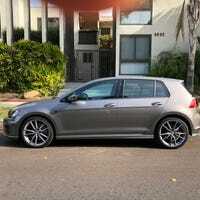 So I have a 2017 Golf R, and the electric power drivers seat is a bit loose... Not enough to be dangerous; who knows maybe it is, but on some shorter stops and harder turns feels like the seat is giving a little bit like I’m rocking forward. Did a motorcycle track-day, didn't crash! On Labor day, a few friends and I went to Buttonwillow Raceway in So-Cal for 10 hours trackdaybruh. We got up at 5:30am, got some Subway, which to my surprise was open that early, then headed to the track for setup/tech inspection. For this track event, the configuration was set to one of the longest ones, #1. Oh yeah. I bought a new motorcycle! So it’s been a while since I last posted something about my car/bike here. And lo, a new bike has blessed me with its presence! There were lots of cool ones. Was at my carwash guy today in Marina Del Rey, CA; and low and behold, there were many cool cars. Turns out the Lancia and the Jag were owned by a car flipper, so maybe I’ll see more cool cars as time goes on! Track day at Laguna Seca? So I’ve been listening to the Everyday Driver podcast, these guys made films about M3s and Porsches among other things, and they’ve brought up a track day event up at Laguna Seca. That got me interested in doing one. buying a car you didn’t truly consider until 3 weeks before buying it. Cause, that’s what I did. I was on the hunt for a new car because I was tired of driving my 2008 Mercedes CLK550 and wanted something with: more utility, better mpg, and something that was more modern. Here are all of my previous modes of transport.